It is obvious why the morality of altruism is a tribal phenomenon. Prehistorical men were physically unable to survive without clinging to a tribe for leadership and protection against other tribes. The cause of altruism’s perpetuation into civilized eras is not physical, but psycho-epistemological: the men of self-arrested, perceptual mentality are unable to survive without tribal leadership and “protection” against reality. The doctrine of self-sacrifice does not offend them: they have no sense of self or of personal value-they do not know what it is that they are asked to sacrifice—they have no firsthand inkling of such things as intellectual integrity, love of truth, personally chosen values, or a passionate dedication to an idea. When they hear injunctions against “selfishness,” they believe that what they must renounce is the brute, mindless whim-worship of a tribal lone wolf. Rand’s main error here is to assume that altruism is a theory that can be logically applied. But this is not the case at all. Individuals whose desire to help the “poor and downtrodden” causes them to support harmful social policies are not motivated by some distinct ethical theory which they logically apply to social conditions. Their support for harmful social legislation is driven almost entirely by emotions, many of a strongly narcissistic cast. Nor are these emotions themselves a product of prior ideas or “premises,” as Rand would have us believe. Rand comes much closer to the truth when she links altruism with tribalism. Altruistic sentiments probably have their origin in man’s tribal past (for the obvious evolutionary reasons). But Rand’s disgust with tribalism causes her to caricature it to the point of serious distortion. Contrary to what Rand claims, men of pre-historic times were not the mindless, fearful, self-sacrificing altruists she portrays them as being. There are, to be sure, other residues, other sentiments, other psychological complexes that can lead to humanitarianism. Not only that, different motives may operate in different people. What is crucial to understand is that humanitarianism (or Rand’s “altruism”) is not the product of a reasoned-out theory. Refuting the theory of “altruism” (or the “theory” of humanitarianism) will have little, if any effect, on those who subscribe to these doctrines, for the simple reason, that strong emotions, many of them containing an innate component, are the primary causes of these pernicious psychological complexes. Humanitarianism is worthless from the logico-experimental point of view [wrote Pareto], whether because it has no slightest intrinsic soundness of a scientific character, whether especially because even if, on an assumption devoid of any probability, it had some points of soundness, that fact would not help as regards spurring human beings to the requisite activities.... A similar judgment may be passed upon the work of our “intellectuals” as leading to few results that are beneficial and to many that are very bad; because, from the standpoint of sentiments, [intellectuals] shut their eyes to realities as the latter stand reflected in many sentiments that they condemn from failure to grasp their role in society; and because, from the standpoint of logico-experimental science, they reason not on facts but on derivations, and from the latter draw, by a logic inopportunely thorough-going, inferences altogether at war with facts. Politics of Human Nature 7: Psychology and social type of the businessman. Ayn Rand imagines a polity where entrepreneurs and capitalists are free to do as they like. But where is this freedom supposed to come from? Who is going to defend it? Can merchants and industrialists, capitalists and entrepreneurs be counted on to defend their freedom from threats, both foreign and domestic? Not according to Joseph Schumpeter. In order to defend freedom, one must be able to lead men in battle. But this is precisely where the typical entrepreneur-businessman, dominated, as he is, by Pareto’s combination instinct, tends to fall short. There is surely no trace of any mystic glamour about [the industrialist and the merchant] which is what counts in ruling men, [wrote Schumpeter in Capitalism, Socialism, and Democracy.] The stock exchange is a poor substitute for the Holy Grail. We have seen that the industrialist and merchant, as far as they are entrepreneurs, also fill a function of leadership. But economic leadership of this type does not readily expand, like the medieval lord’s military leadership, into the leadership of nations. On the contrary, the ledger and the cost calculation absorb and confine. I have called the bourgeois [i.e, the businessman] rationalist and unheroic. He can only use rationalist and unheroic means to defend his position or to bend a nation to his will. [In other words, the businessman is not good at using or applying force, so he must use his wits, just as Pareto warned.] He can impress by what people may expect from his economic performance, he can argue his case, he can promise to pay out money or threaten to withhold it, he can hire the treacherous services of a condottiere or politician or journalist. But that is all and all of it is greatly overrated as to its political value. Nor are his experiences and habits of life of the kind that develop personal fascination. A genius in the business office may be, and often is, utterly unable outside of it to say boo to a goose—both in the drawing room and on the platform. Knowing this he wants to be left alone and leave politics alone. Now Schumpeter wrote these words in the late thirties, when capitalism was clearly on the defensive. Many defenders of capitalism were frustrated with the inability (or unwillingness) of businessmen to defend capitalism against attacks from both the fascist right and the socialist/communist left. Rand herself seems to have at least had an inkling of some of the issues raised by Schumpeter; for we find her, in Atlas Shrugged, going out of her way to cast the businessmen in the role of a quasi-Nietzschean superhero, with the dollar sign replacing the Holy Grail; and we also find her formulating a theory to explain why businessmen failed to adequately defend themselves: the “sanction of the victim,” wherein the victim (i.e., the businessman) accepts the morality of his enemies (i.e., altruism) and hence deprives himself of the moral high ground. Is Rand’s explanation plausible? Not really. There are, it should be clear, far more plausible explanations for why businessmen fail to defend themselves. In the first place, where individuals have some choice in their vocation, this very choice serves as a selective or screening process, since individuals tend to choose vocations that best fit their innate talents. So those who combine intelligence with the ability to delay gratification and the willingness to put in long hours of work will not only feel themselves drawn to a career business, but, even more importantly, such individuals will be more likely to succeed in such an endeavor. And given the extensive division of labor in an advanced industrial society, the tendency is toward specialization in the development of one’s abilities and talents, so that individuals who devote most of their time to business activity (as they often must to succeed), end up developing only those skills useful in business at the expense of skills that might be useful in other endeavors, such as skills of political or military leadership. Hence the processes of societal selection under capitalism produce a class that is not particularly adept at defending its own interests. Nor is it merely the man of force and violence, the marauder and plunderer, that poses a threat to the productive classes. There is another type of individual who arises in advanced civilizations who also can cause serious problems to a free, market-orientated social order. This individual goes by a number of names: socialist, humanitarian, progressive, idealist, social democrat, altruist. Rand was particularly concerned with defending the businessmen from this specific social type. In the next series of posts, I will examine the extent Rand’s analysis of the humanitarian syndrome accords with the facts. Objectiblog's Neil Parille looks at the ongoing campaign to invent the Perfect Rand. "A half-truth, in many issues, is more misleading than an outright lie; it is more of a distortion. Therefore if a reporter cannot reveal the whole truth in a given issue, he should not touch that issue at all." -- Ayn Rand, Objectively Speaking, p. 68. One of the most genuinely weird features of Objectivism is the compulsion amongst orthodox Objectivists to mythologize Ayn Rand. This compulsion extends to even the most trivial aspects of her personality or life story, which, in classic cult of personality style, are the subject of deliberate and extensive rewriting, airbrushing, and half-truths until they are in accord with Objectivism's internal mythology. The apogee of this compulsion to falsify in the service of the Great Randian Myth is probably James Valliant's bizarre The Passion of Ayn Rand's Critics (“PARC”), a must-read for anyone who wants a glimpse inside Objectivism's cultic side. I've documented its many apple-polishing distortions and - often hilarious - outright fakery in considerable detail here. Orthodox Objectivists, led by the Ayn Rand Institute, claim that Rand has been maliciously portrayed in the past by evildoers, and that they are trying to restore the true picture of Rand as humanity's foremost moral and intellectual exemplar. However, given that it's been recently confirmed that the ARI have surreptitiously and comprehensively rewritten Rand's own work to be more consistent with the myth, it is unlikely they'll be any less dishonest in the presentation of Rand's life. The response from the ARI has been a strenuous counter campaign both denigrating the Brandens and trying to replace this warts-and-all-portrait of Rand with one ever more airbrushed into mythological consistency. In 2005, ARI supporter James Valliant published PARC. This book -- which is endorsed by Leonard Peikoff and is sold by the ARI’s book store – was in effect a proxy for Peikoff’s belated in-depth response to Barbara Branden’s biography (and Nathaniel Branden’s memoirs). Following what appears to have become something of a party line, Valliant (following Peikoff*) explicitly identifies an occasional anger as her only character flaw, and that even that was well justified; and perhaps in the bigger scheme of the fight for Objectivism against the forces of evil, not even a character flaw at all. Rand: "...he [Branden] kept insisting that he sees some wonderful qualities in her, which he could not define and which were not seen, nor even sensed, by anyone else (most emphatically not by me)..."
Rand: "And what did he get in exchange for his mind and soul? Nothing. That is the grotesque emptiness of evil. Nothing but the empty chatter with [Patrecia] at their lunches...listening to the theatrical prattling of a girl who bores much lesser minds within half an hour...what else was there to do with a girl of that kind?...If one looks at the above in realistic, existential terms, it becomes pure insanity: why would would a man want to give up all the values representing his mind and his career...in exchange for this sort of silly, trashy, vulgar, juvenile nonsense?" Rand: "[Patrecia] was disgustingly phony, and I felt strained..."
Rand: "Symbolically, this was a battle between my universe and [Patrecia's]. Existentially and objectively, the choice to keep [Patrecia's] and to reject [mine] speaks for itself..."
Rand: "Existentially, he must not have any romantic or even friendship relationship with [Patrecia]..."
Rand: I feel the strongest contempt I have ever felt - and I regard [Branden], for his relationship with [Patrecia] as the worst traitor and the most immoral person I have ever met..."
Like the old Chico Marx line says, who are you going to believe - Valliant or your own lying eyes? Similar mental gymnastics have been performed by ARI scholars such as Robert Mayhew as they try to rationalize Rand’s claim that her later revisions to her early novel We the Living were only “editorial line changes” when in fact they were substantial. 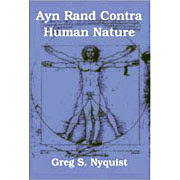 Most would see the first edition of We the Living as representative of a Nietzscheian phase in Rand’s early life, a phase she hadn’t completely left as late as the publication of Atlas Shrugged. Likewise, even though Rand praised Nathaniel Branden’s works (and declined to delete them from reprints of her anthologies), ARI scholars such as Mayhew and Tara Smith studiously avoid any mention of him. In fact, Mayhew even attributes an essay by Branden to Rand in the index of his Ayn Rand Answers: The Best of Her Q&A. A particularly blatant example of rewriting Rand’s life was done by Leonard Peikoff in his 2006 account of Ayn Rand’s decision to stop smoking. Barbara Branden relates in Passion that Rand, a lifelong smoker, refused to stop smoking claiming that there was insufficient evidence that smoking caused cancer. Branden states, however, that Rand immediately stopped smoking in 1975 when her doctor showed her an x-ray indicating that there was a “malignancy” in her left lung. (The malignancy turned out to be cancer.) Rand put out her cigarette in the doctor’s office and never smoked again. Branden’s version of events was confirmed in 2000 by ARI writer Andrew Lewis. Miss Rand smoked for many years, until her doctor told her to quit. She put the cigarette out in his office and never smoked again. Q: If Ayn Rand were still alive, would she smoke? A: No. As a matter of fact, she stopped smoking in 1975. When the Surgeon General in the 50s claimed that smoking was dangerous, he offered nothing to defend this view but statistical correlations. Ayn Rand, of course, dismissed any alleged “science” hawked by Floyd Ferris, nor did she accept statistics as a means of establishing cause and effect. Statistics, she held, may offer a lead to further inquiry but, by themselves, they are an expression of ignorance, not a form of knowledge. For a long period of time, as an example, there was a high statistical correlation between the number of semicolons on the front page of The New York Times and the number of deaths among widows in a certain part of India. In due course, when scientists had studied the question, she and all of us came to grasp the mechanism by which smoking produces its effects—and we stopped. Doesn't this prove, you might ask, that she was wrong to mistrust the government? My answer: even pathological liars sometimes tell the truth. Should you therefore heed their advice? Peikoff’s version of events is a half-truth and thus, according to Rand, perhaps worse than a lie. Non-Objectivists would probably be content to say that it was so misleading as to constitute a lie. 1. Rand had an inflated ego and a self-estimation that bordered on the delusional. Not only do ARI supporters have to justify this, but during Rand’s life the sycophancy of the orthodox Objectivism’s current leadership no doubt fed Rand’s borderline megalomania. For example, Allan Gotthelf relates that Rand once said that “I’ve done for consciousness what Aristotle did for metaphysics.” Gotthelf responded, “yes, that’s true.” In particular Leonard Peikoff has paid a high personal price to become Rand’s legal and alleged “intellectual” heir. He was even exiled by Rand to Denver for a time for failing to insufficiently advance Objectivism. 2. Rand also set in motion the claim that her philosophy did not undergo any changes, even telling an interviewer later in her life that she had held the same philosophy since her first memory at age 2 and a half. That Rand went through a Nietzschean phase would suggest that she was not a consistent Objectivist and that her own life’s story was false. 3. A high estimation of Rand the person functions as what sociologists call a “boundary marker.” It identifies those who are “in” and “out.” Those who dissent from a high regard for Rand the person are most likely to question aspects of her philosophy, such as her interpretation of other philosophers and the lack of empirical basis for many of her judgments. 4. Rand saw a particularly close connection between her philosophy and her life. She famously said that her life was postscript to her philosophy: “and I mean it.” To Rand her life was the perfect exemplar of an ideal Objectivist and living proof that the theory/practice and mind/body dichotomy that plagued Western civilization since Plato had been put to rest. If Rand can’t live up to Objectivist standards, then what does that say about Objectivism as a “philosophy for living on earth”? Continuing on the series of clips (here and here) from Rand on Donahue back in 1979, we come to perhaps the most interesting part of the encounter. Mostly it's been a series of softball questions to which Rand replies with her standard verbalisms, which in turn Donahue doesn't really pursue. Or if he does, it's on the most vague and timewasting questions, such as the issue of, yawn, Original Sin. Whereas practical issues, such as how Rand intends to fund the government in her forthcoming utopia, he allows her to entirely evade. But at around 8:20 in Pt 3, and continuing on into Pt 4, we come to the incident that made this appearance somewhat notorious. A young woman mentions that in high school she was formerly impressed by Rand's philosophy, but was now "better educated". Now, she doesn't realise it, but this is exactly where Rand is most psychologically vulnerable. After the publication of Atlas Shrugged she fell into a deep depression because the book was largely ignored by the intellectual community. She desperately craved the attention and even more the respect of the first-rate minds of her generation - a craving that went unrequited, and still does today. Now, to have someone imply that her philosophy is something that would only impress the young and naiive, and not the greatest intellectual achievement of all time as she and her circle of sycophants insisted, hits her right where it hurts. She refuses to answer the question, and pretends it is an issue of lacking "politeness" -as if her own purple polemical style was that of Miss Manners herself. And she won't let it go, even as Donahue tries to move the discussion on. It's a telling moment. In other words, a commercial society, a society dominated by people who live by their wits and have become increasingly habituated by market forces to think almost exclusively in terms of profit and loss, becomes, over time, less fit for using force to defend the country and prevent the “initiation of force” by foreign aggressors. Why is it that the United States is so vulnerable? At least part of the reason is that people have acquired “the habit of considering policy from a commercial standpoint and of judging it only in terms of profit and loss.” The U.S. electronic infrastructure could be hardened to withstand EMP attacks; such hardening, however, would cost billions of dollars and require massive government interference, in the form oversight, of the commercial electronic infrastructure. In other words, defending a nation against EMP weapons is not compatible with the small government, laissez-faire, anti-tax ideals embalmed within the Objectivist politics. Nor is it compatible with the ruling elite generated within nations dominated by a market-based economy, where Pareto’s “combination instincts” dominate the ruling elite at the expense of group-persistence sentiments, and men of courage and force are marginalized by lawyers, bureaucrats, capitalists and entrepreneurs.